We certainly couldn’t do a Retro-Week without a casserole, right?? You may have noticed we don’t have many casseroles on our site. And we kind of pride ourselves on having only have one (yes, one!) recipe that calls for cream-of-anything soup (don’t mess with funeral potatoes.) But there is something so nostalgically comforting about a nice warm casserole, and even more so if it involves a crunchy topping. 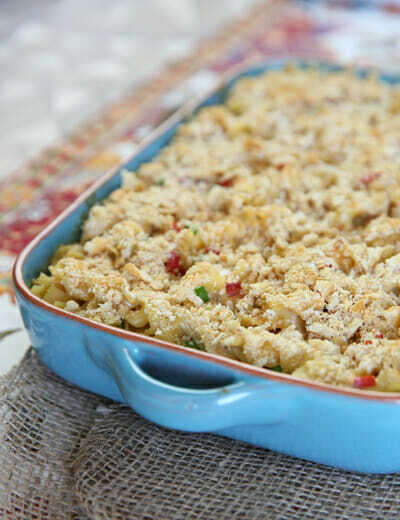 Like I’m sure many of you did, we ate a lot of casseroles in my house growing up, and some of my favorites are still major comfort foods for me. But now that my tastes have matured a little, I see that many of the popular throw-together casseroles have the same problems that make them not so appealing to me now. They often involve bland flavors, over-cooked chicken (from putting already cooked chicken in a casserole dish and then baking it more) and mushy noodles or rice. And while I don’t have anything against condensed soups, I’d rather make something from scratch because it usually tastes much better. 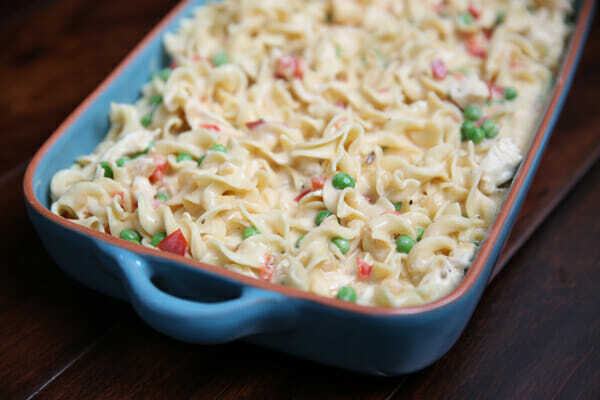 This Chicken Noodle Casserole is a new family favorite, and it involves some tricks that solve the problems I was just talking about. 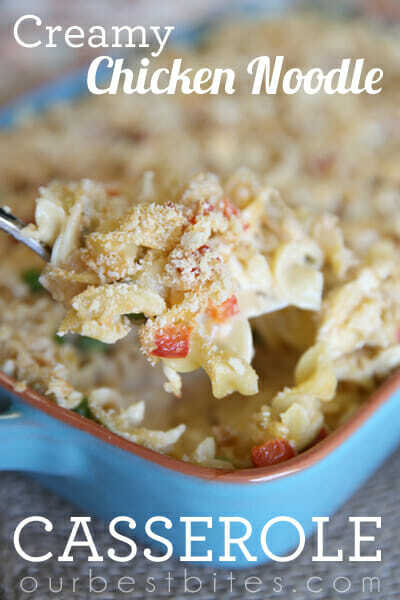 It’s just a good, creamy, cheesy, comforting, dish with noodles, chicken, and veggies and topped with a buttery crumb topping. Let’s make this. Bring some salted water to boil in a dutch oven. We’re only going to boil the noodles for about 3 minutes. They should be just barely al dente at that point and that’s how we want them. 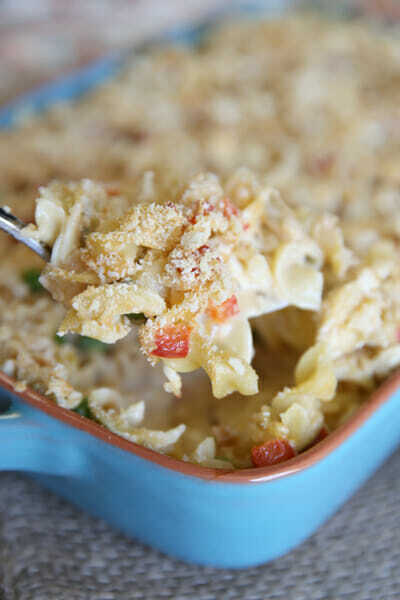 By under-cooking the noodles here, we can add them into the casserole to let them finish cooking in the oven and avoid the mushy-noodle syndrome casseroles so often fall victim to. As soon as they’ve cooked enough, we’ll rinse them in cold water to stop the cooking process. 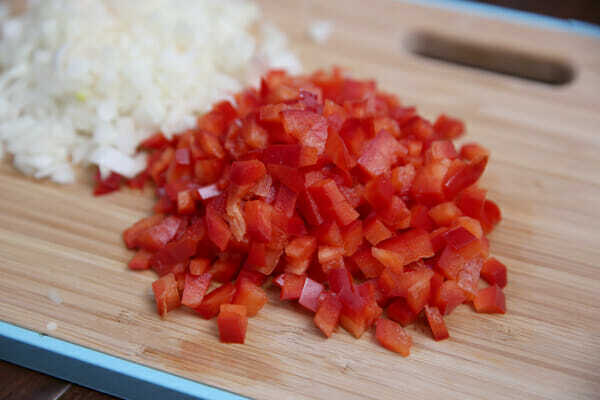 Now that our pot is empty, add a pat of butter and saute some sweet bell pepper and a finely diced onion. Those will cook for about 5 minutes and then you can take them out and set them in a bowl to the side. Toss in a few tablespoons of flour, and whisk it up for a minute. Then very slowly add a little bit of liquid at a time (we’re using both chicken broth and half-and-half here) and whisk whisk whisk. 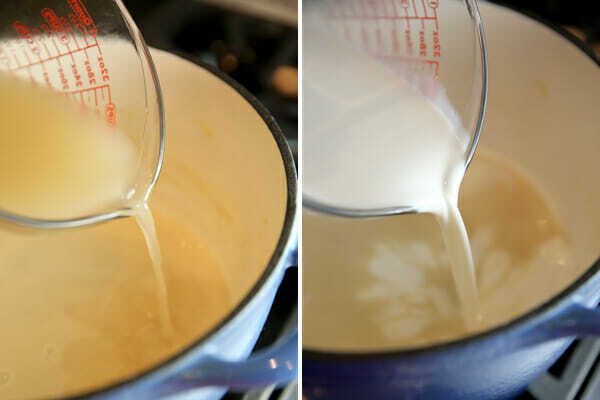 It will thicken immediately, and one of the secrets of a non-lumpy sauce is not to pour in all of the liquid at once. 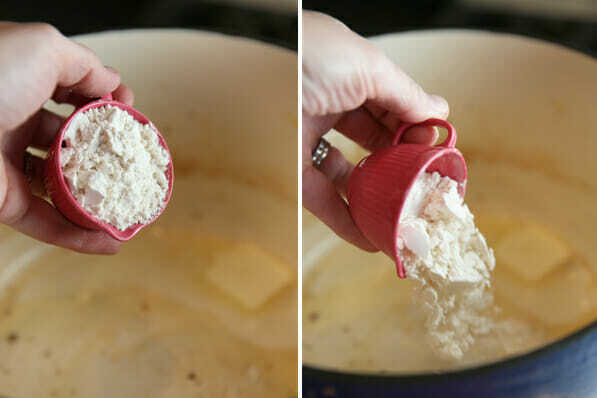 Always add a little at a time, or a very slow steady stream as you whisk the entire time to incorporate the flour mixture. After that sauce boils for about 5 minutes, we’ll add chicken directly to the pot. Gently poaching it will not only ensure juicy chicken, but it will flavor the sauce as well. Another trick here is that we’re under-cooking the chicken just slightly, as we under-cooked the noodles. This allows it to finish cooking in the oven, as opposed to over-cooking in the oven and ending up dry and chewy. Pull the slightly pink chicken out and shred it into bite-sized pieces. While you’re waiting for the chicken to be cool enough to handle, you can whisk your cheese into the sauce. Sharp cheddar provides great flavor, and American gives the sauce body and a creamy smoothness. 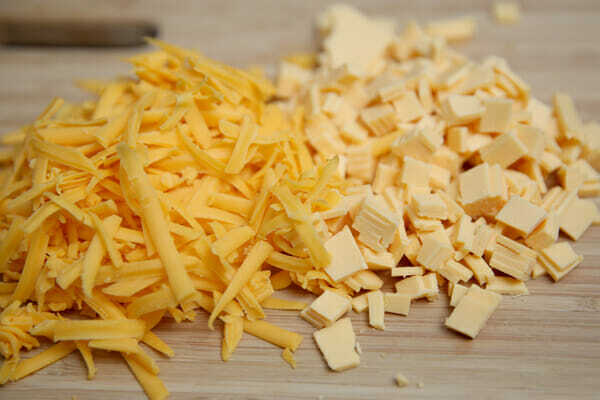 In addition, American cheese provides unique stabilizers that prevent the sauce from breaking so it stays creamy and smooth from start to finish. Before we throw this all together, you’ll need some frozen peas. 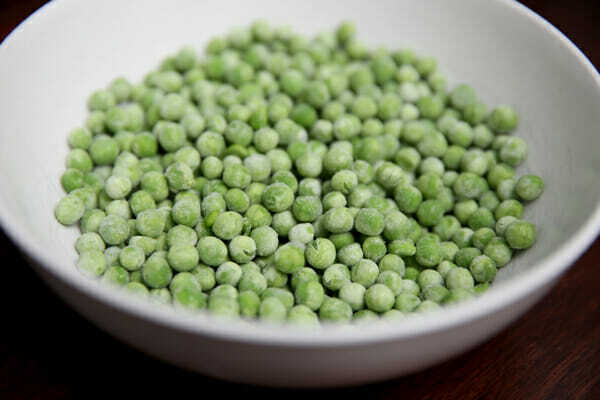 I was just texting Kate the other day about how I don’t like peas, but oddly enough I think they totally work here. They just provide a mellow sweetness (and a pop of color) that just sort of blends in well. To avoid extra moisture in the sauce, I run my peas under warm water, drain them, and then pat them dry before putting them in. No just toss it all together. And you can’t have a retro casserole without a retro topping. Corn flakes and potato chips were on the list I’m sure, but the winner is buttery Ritz crackers. 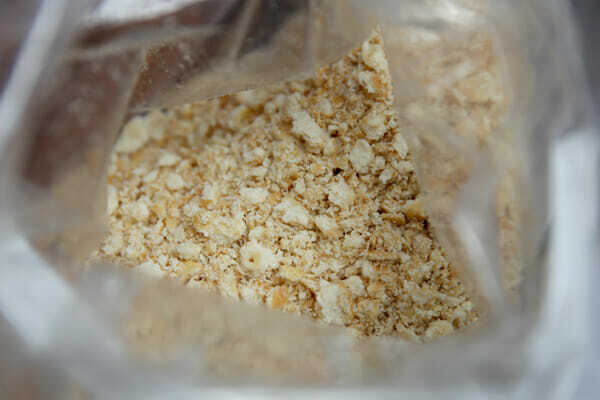 They work like bread crumbs would, and make a crispy crunchy topping you’ll for sure want to pull off and eat before it’s actually time to serve this. It all bakes up together for about 15 minutes. That finishes cooking the chicken and pasta perfectly, and toasts the buttery crumb topping. Make sure you let this sit for 10-15 minutes so the sauce can set up before serving. My kids devoured this, and my husband and I stuck our forks in the leftovers for the rest of the day. New family favorite! If you want to prep this ahead, you could definitely make it up to the point where you top with crackers. I would put it in the pan and then cover and refrigerate. Before you bake it, give it a stir to distribute the sauce, and then sprinkle the crackers on right before baking. 1. Bring 4 quarts water to boil in a Dutch oven. Add noodles and 1 tablespoon salt and cook, stirring often, until just al dente, about 3 minutes. 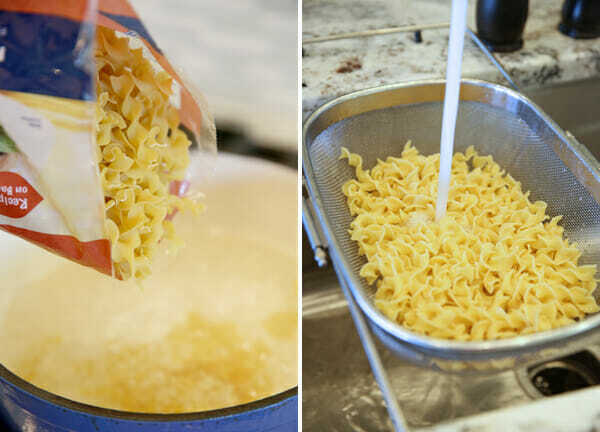 Drain noodles and rinse with cold water until cool. Drain again and set aside. 3. Adjust oven rack to upper-middle position and heat oven to 425 degrees. Remove pot from heat, transfer chicken to plate, and shred into bite-size pieces once cool enough to handle. 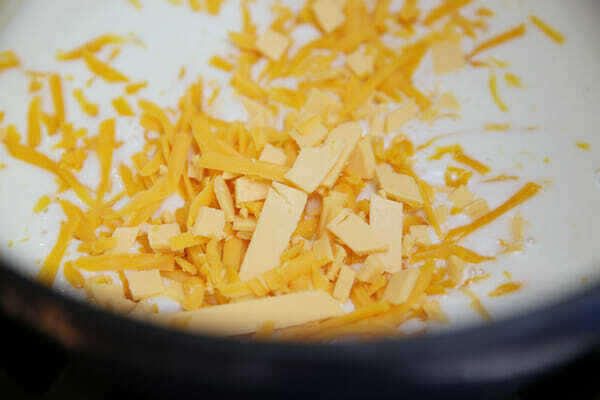 Whisk American and cheddar cheeses into sauce until smooth. Stir shredded chicken, noodles, bell pepper mixture, peas, 1 1/2 teaspoons salt, and 1 1/4 teaspoons pepper into cheese sauce. 4. Transfer mixture to 13×9 inch baking dish and top with crackers. Bake until golden brown and bubbling, about 15 minutes. Let casserole cool on wire rack for about 15 minutes. Serve. We love Granite Flats too! I love casseroles. Can’t wait to try this! Totally loving Granite Flats, though I have to catch either the late-night reruns or watch it online. LOL And I totally love old-fashioned casseroles too!! Definitely giving this one a try!! Yeah!! I like that show for the same reasons you stated. We don’t have kids yet but I want to make it a habit of watching shows they could watch with us and this show is perfect for a family to watch together. I’ve been shredding up rotisserie chicken & using that in casseroles & such. A lot of times the regular ones are a bit dry, but some grocery stores sell an extra-large version which I’ve had a lot of luck with. 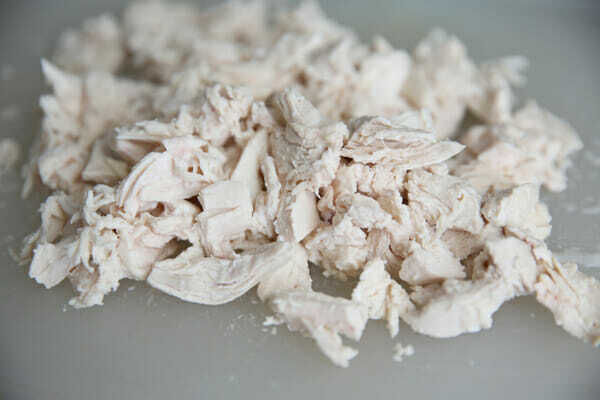 I just shred it up & freeze it until we need it ~ we hate dry chicken! Studio C is the best show on BYUTV. Our whole family laughs so hard. We haven’t checked out Granite Flats yet. my family loves chicken noodle casserole!! Excited to try out a new recipe! I LOVE old school casseroles like this!!! Yumm!!! We have kids ages 5-15 and we all love Granite Flats. It is great to have a show that the whole family can enjoy. Also love your site and cookbooks, thanks for all your hard work. I love all your yummy ideas.I just started my own blog and would love anyone to stop by and check it out. Thanks! I saw the first few episodes of Granite Flats at my parent’s house and loved it! The casserole looks yummy. Thanks for another fun recipe tot try. Whoa…this looks delicious and so easy. Thanks for sharing! We’ve been loving Granite Flats too! Love the ideas for the casserole, I’m going to incorporate them into the recipe I’ve already been using next time I make it! I’m a fan of the casserole! Definitely trying this one out. Thank you! YAY!! 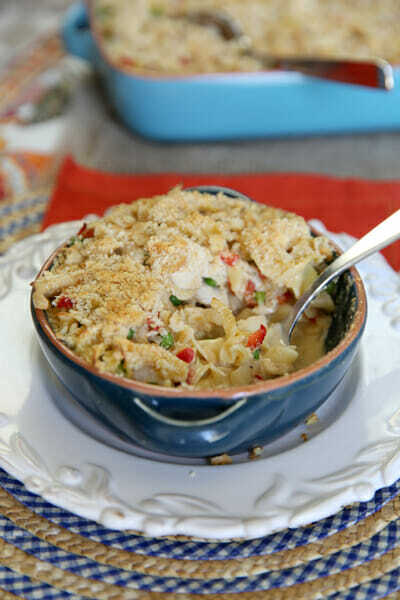 We LOVE chicken noodle casserole and I’ve been wanting to find a way to make it without the cream soup. And I love the addition of the peppers. THANKS!! I just saw a little thing on granite flats. I’ll have to check it out. Much love, ladies! YUM!! Definitely trying this next week! What a fun post! Thank you for finding dinner for me tonight! I’m guessing that you add 1 1/2 cups of peas, not 1 1/2 peas. Looking forward to trying this. I just bought two packages of No Yolk noodles (required for coupon), so this will help use them up. Just made this for dinner…it was soooo good! This looks delicious! I wasn’t sure if Granite Flats would be boring, but it is excellent! I am really enjoying it! We have been loving Granite Flats. 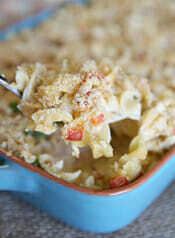 This casserolle looks soo good. I just wanted to thank you for sharing your recipes on your blog. I find all of your recipes easy to make and delicious. I always say choosing the correct recipe is 90% of the battle when it comes to cooking great food. I recommend your website and cook your recipes very often. I am making your fried rice recipe tonight and I have a stack of others I have printed from your website that I can’t wait to try. I take it you don’t have to grease the pan? Also how many would this serve(no small children around)? Looks like a winner. Thanks. No, you don’t need to grease the pan. It makes a full 9×13 pan, so you can decide from there how big your servings would be, but I’d say 6-8 generous servings and 8-10 smaller ones. Lovely casserole – I love anything chicken!! Wanted to point out two typos in your recipe (print version). American cheese to be chopped “coarse” and you have 1 1/2 peas – I think you left out the word “cups”. LOL!! Thanks for the great recipes!!! I just started watching Granite Flats and was so happy that it’s a show I can watch with my young kiddos in the room. As soon as you said a cross between Goonies and Wonder Years, I knew what you were talking about. (I’m a BYU alum, too, and heard about this show at TOFW. Missed you guys this year!) I agree on all counts about casseroles…boring but nostalgic/comforting! Looking forward to trying this one on the fam! love this post, love the show, can’t wait to try out this casserole! I’m making this tonight. Its all ready to go in the oven for after soccer. I used Chicken in a Biscuit crackers since I didn’t have any Ritz for the topping. I think it looks yummy!!!!!!!!!!!!!! HO. LY. Deliciousness, Batman! Just made and ate this and it was insanely awesome. And I am a non-casserole fan generally (well, funeral potatoes don’t count as a real casserole, right, since they’re a side dish?). I was a bit worried about the sauce thickening up, but after I cooked the chicken in it, it was perfect, and the 15 minutes of resting time after cooking made everything come together just right. The American cheese didn’t melt when I whisked it in, even after turning the burner back on, but the oven took care of that. Is that a typical feature of that particular cheese? And am I the only person in the entire country who has never cooked with American cheese? Not a snob, I swear, because while I was whisking I was thinking I should have just used Velveeta…mmmmm…Velveeta…. But thanks again for another wonderful recipe. This one was particularly fantabulous! A true keeper. Holy deeelish! This was a delight! Thanks for sharing. It will surely be in our family rotation for meals! We were pleasantly surprised by Granite Flats, too. I even find myself keeping track of how many days until the next episode comes out. Thank you so much for your kind words about Granite Flats. I have been a fan of yours for years. My family jokes that they don’t even need to ask me where my new recipe came from because they already know it came from Our Best Bites! My husband is the creator of Granite Flats. We have 3 young children and he recently graduated from the film program at BYU. This show is an adaptation of a script he wrote while at BYU. He wanted to create something “different” than what is currently on TV. I am so glad that people are responding positively to the show. Thank you so much for spreading the word!!! I can’t remember the last time I received a package in the mail. What a great giveaway! I love both you and Sara. And every recipe I have tried of yours has been a HUGE hit! Thanks for making time in the kitchen so productive. I love care packages too! My mother-in-law often sends us a package with something for everyone…my kids love it! They get so excited to see what everyone go. Thanks for having this idea. What an amazing, well thought out giveaway! Love it all! Love Granite Flats! Great family show. Not usually a fan of American cheese but this recipe has me tempted to try. Loved this and double love the fact the sauce is homemade (yet easy) and there’s no cream of something soup! Thanks for plugging Granite Flats! My husband works at BYU broadcasting, so we’re always excited when people really like the shows and talk about them. Love your blog!!! Ok, since my husband hates casseroles, I would not have bothered to try this–except that it is from ya’ll–and that means there’s a 99% chance that we will ALL like it. Especially me. If you are looking for ideas to post, can I request tasty and easy camping foods? Do you think this casserole would freeze all right? I was looking for a casserole to make for a friend who is sick. All the chicken casseroles I came across required a soup base, which I’d rather not use. This casserole was amazing, a bit more time consuming, but worth the effort. I only changed a few things, I omitted the peppers, added minced garlic, celery, frozen peas and carrots and thyme, and cooked the veggies a little longer until golden. This tasted just like chicken noodle soup. Thank you for sharing this fantastic recipe. I printed this out months ago, but somehow set it aside and just found it again ~ made it tonight and it is seriously awesome! My husband really liked it, our 10 year old son went back for seconds (never happens!) and (I feel your pain here, Kate!) our ultra-picky 7 year old ate it with no complaints….. (I had to use Velveeta rather than American cheese as I had none on hand, but it was terrific anyway and it didn’t taste like Velveeta at all 🙂 although next time I will try the American cheese as called for…. Obviously more time consuming than the soup based version, but the end result is much better, and in my opinion it is worth the extra prep 🙂 I have both of your cookbooks and can’t wait for your next one ~ You ladies are an amazing team, and you both rock! Made this tonight and it really hit the spot! But I’m scared come next week with school starting, baseball and T-ball season revving up, teaching my kids piano, new calling as RS pres and teaching preschool I will not be able to cook another homemade meal for months. Any freezer tips? Maybe make the sauce and chicken to freeze and cook the noodles and vegs day of for a quick meal? Cause nothing says RS love like a casserole (besides a side of jello). I need to visit your freezer meal section for some more meals to get me through. Thanks ladies! Sorry I missed this question a while ago! Just make it completely and let it cool before freezing. That should do it! Just curious, if I do not have a Dutch oven, what kind of pot can I use in its place? Any kind of large stock pot will do. Awesome recipe, dare to try this, 2 1/2 cups mini penne noodles, due to the fact that egg noodles are soggy. Cook penne noodles half cooked to 3/4 cooked at the most. Trust me, i hate bloated noodles and if you do as well, give it a go, than the leftovers will be bloated but that’s what you dull out to family to try Ha Ha! While I realize this is not designed to be a healthy recipe, I made it a little healthier, mainly because I was using what was in the kitchen. 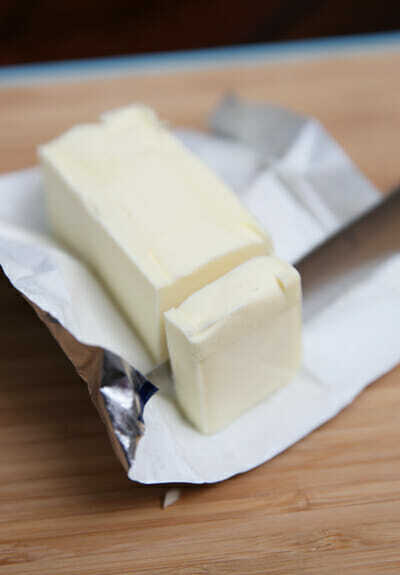 Used skim milk instead of cream and half of the butter replaced with olive oil. It still thickened appropriately. Also used chicken I had pre-cooked the day before which was convenient. 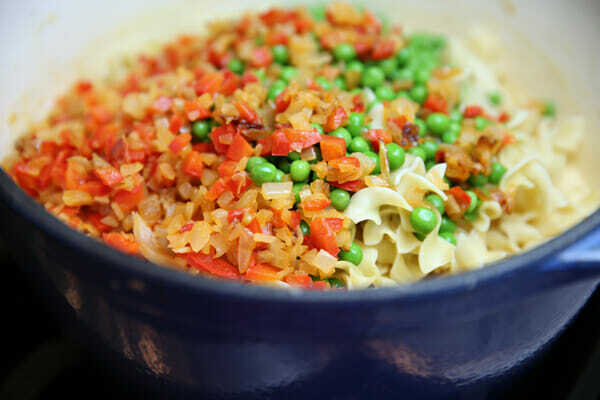 Nice recipe and I think the kids will love it before going to play basketball tonight. Won’t be hard to digest. Oh, my, my, is this ever good! I made just a few modifications; Because there are only two of us, I used half the noodles, no cheddar, and 1/2 brick of Velveeta. I used Herb-Ox No-sodium chicken broth and whipping cream, and carrots, onions, and peas in the casserole; no peppers. I cooked the chicken in my slow cooker & shredded it in the mixer. I topped it all with the crushed Ritz, and served it after baking with some fresh asparagus on the side. Changes for next time: I will cut back on the amount of noodles a little next time because my 8 x 8 pan was a bit overly full, and I’d add a little more broth next time. I would switch to the half & half because heavy cream is so very, very rich, but it also put a big smile on my face and a dopey expression. It’s THAT GOOD! You must know, I have found the perfect comfort food. I can’t wait to serve it to the kids when they visit! This is a truly outstanding, delicious recipe! We ate half the pan, and I’m going to freeze the other half. So, I actually hate American cheese. How do you think cream cheese would work in this? Thank you, thank you, thank you! I LOVE casseroles, but my husband can’t stand anything made with cream of soups. He doesn’t like cream sauces in general, but I could *probably* get him to try this one with just the half and half. Thanks so much! I’ve made this and it.is.yummy. I did substitute rotisserie chicken for homemade to speed up time. It took longer to make than I thought it would. Perhaps I’ll get faster as I make it more. It was worth it though. Next Post ❯ Next post: Retro Week Goody Bag Giveaway!